Cinebook, Publisher of the best-selling European comic books for all ages. 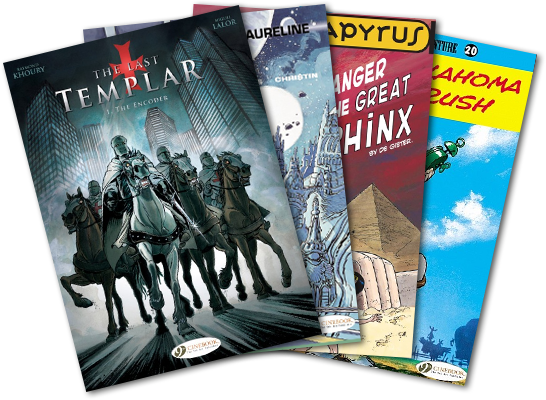 The comic book and its close relative, the graphic novel, are a highly respected art form in France, Belgium and the rest of Western Europe—so well regarded that Cinebook takes our tagline (“The 9th Art Publisher”) from the classification of comic books as No. 9 on the list of plastic arts in Europe (Plastic Art list: 1st-Architecture; 2nd-Painting; 3rd-Sculpture; 4th-Engraving; 5th-Drawing; 6th-Photo; 7th-Cinema; 8th-Television; 9th-Comic books), In fact, one of every eight books sold in France is a comic book. Since the end of 2005, Cinebook has worked to become the premier publisher of the Franco-Belgian Ninth Art in English in markets dominated by American superhero comics and Japanese manga. Cinebook selects series and individual titles based on a number of factors in order to please a wide range of readers—factors such as geographic settings, protagonists’ age and gender, historic themes, genres, etc. René Goscinny, co-creator and writer of the Asterix series, has sold 500 million books. His Lucky Luke, a cowboy character dubbed “the man who shoots faster than his own shadow” and created with Morris, has sold over 250 million copies in multiple languages and is popular with all ages. Along with Lucky Luke, Cinebook released in 2008 Goscinny’s hilarious character the grand vizier Iznogoud, who wants to become Caliph instead of the Caliph in old Baghdad. Edgar P. Jacobs (Blake & Mortimer) and Roger Leloup (Yoko Tsuno), both of whom worked with Hergé (the father of Tintin), have sold, respectively, 12 million and six million copies. Jean Van Hamme is one of Belgium’s most successful contemporary novelists and comic writers. Thorgal, his exciting fantasy series with Rosinski, and Largo Winch with Francq (which was adapted to the big screen in 2008, with a sequel in 2011) have sold, respectively, 13 million and 10 million copies. At the end of 2008, Cinebook added Lady S, Van Hamme’s espionage series with Aymond, and The Francis Blake Affair with Benoit, based on the Blake & Mortimer characters of E. P. Jacobs. In 2010, Van Hamme's most famous series XIII joined Cinebook's catalogue. The adventures of the tattooed amnesiac had never been translated past the 3rd volume before, but they were published at the rhythm of one every two months, and the original series was completed in 2013 – until a second season was launched in 2014, which is being translated concurrently. Raoul Cauvin excels in humorous adventures and visual gags for all ages. His Bluecoats with Lambil, starring two soldiers in the U.S. Union Army during the Civil War, and his Cedric with Laudec, about an eight-year-old boy, have sold, respectively, more than 15 million and eight million copies. Stephen Desberg, an American living in Belgium, is one of the most successful new-generation comic writers for young adults (15 and older) and adults. His IR$ series with Vrancken stars a specialist from a little-known branch of the Internal Revenue Service. The Scorpion with Marini is a swashbuckling thriller series set in the mysterious shadows of the 18th century Vatican. Each series has sold more than one million copies. Francis Bergèse, pilot and aviation enthusiast, is the most reputable illustrator in the area of aviation art and was chosen to be in charge of the new Buck Danny adventures. This series, the creation of Georges Troisfontaines, Victor Hubinon and Jean-Michel Charlier, has sold 15 million copies. Bergèse also adapted non fiction history into graphic novels which have been translated under the label Cinebook Recounts. Sylvain Runberg, a young French author living in Sweden and a rising star of the BD world, created the science-fiction series Orbital with Serge Pellé; the adventures of a human-alien pair of diplomatic super-agents have been met with critical acclaim. With Eduardo Ocaña he gives the reader an alternate version of the life of a great scientist in Darwin's Diaries. Leo, creator of The Worlds of Aldebaran (Aldebaran, Betelgeuse, Antares, The Survivors), takes the theme of the colonisation of space further than most sci-fi comics. His series has sold more than one million copies. In collaboration with Rodolphe, he also created Kenya, a gripping sci-fi mystery in late 40s Africa complete with dinosaurs and UFOs, followed by second season Namibia. Pierre Christin and Jean-Claude Mezieres are two very important figures of French BD, and their creation Valerian and Laureline has defined French science-fiction for over 40 years and sold 2.5 million copies, not to mention it's had a broad and lasting influence over many other works of sci-fi, including Star Wars itself. Now at long last it is being made into a major feature film by Luc Besson, with Dane DeHaan, Cara Delevingne, Rihanna and Clive Owen; Valerian and the City of a Thousand Planets will be out in July 2017. Two legendary series of the ninth art joined the crew in 2009. Billy and Buddy, about a little boy and his canine best friend, and Spirou and Fantasio (created in 1938), the flagship series of Spirou Magazine, have respectively sold 25 million and 20 million copies. Xavier Dorison, a young author but already an old hand of the comic world, has written several highly regarded series with distinguished artists. With Fabien Nury and Christian Rossi, he created SPOOKS, chronicling the otherworldly adventures of a very special team of investigators in early 20th century America. And with the immensely talented Mathieu Lauffray, it's the story of original pirate Long John Silver he tells us, 20 years after the events of Treasure Island. Fabien Vehlmann is regarded as one of the great names in the new generation of comic writers. His wonderfully dark and cynical Green Manor, illustrated by Denis Bodart, delighted English-speaking readers. In 2014, Cinebook began publishing his hit series Alone, drawn by Bruno Gazzotti. This tale of five children waking up in a deserted city has drawn critical acclaim in both French and English, as well as the public’s seal of approval. Thank you for sharing with us a passion for the numerous talents of the Ninth Art!